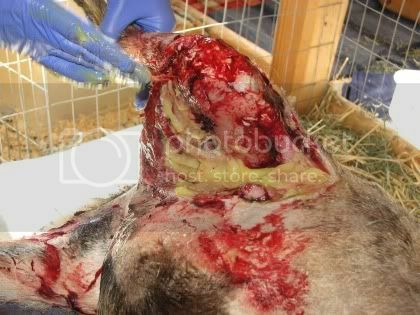 i am going to post some pictures from chewies surgery…GRAPHIC! i think it is important for people to know not only what this little goat went thru for the past couple of weeks but to really understand and respect his extreme courage, strength and his determination to LIVE. he has trust and faith in humans, humans need to honor that trust by him. i will just post the links in order of the surgery so folks have a choice if they can stand to look or not. a timely call or trip to the vet can save an animal a whole helluvalotta pain and agony. 9 Comments on "i am going to post some pictures from chewies surgery…GRAPHIC!" The Vet that did Chewie’s surgery, Brent from AgWest, is such a kind kind man to the barn guys. And needless to say, a wickedly talented Vet. 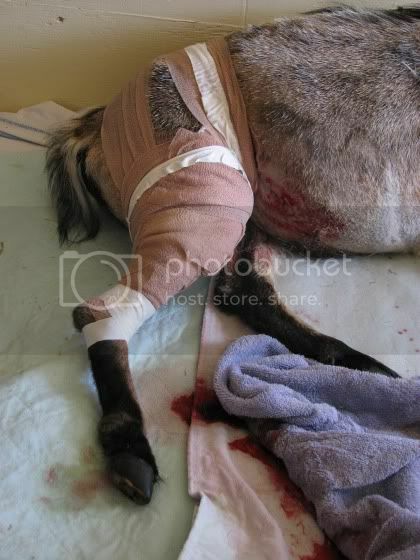 He said he had never seen such devastating damage done to such a wee goat and he was amazed that he was still alive, never mind standing and hobbling around. What a testament to Chewie’s spirit!!! Um, that special boy needs a new name Carol. Something strong and invincible…..
i’m sad i missed seeing the surgery. stupid sleep thanks for the photos! i’m coming out on sunday around 1230/1pm. OMG! What did the Vet say his prognosis is? How in the hell did anyone think that he didn’t need a Vet? Poor little guy, left to the mercy of others! Brave little dude. 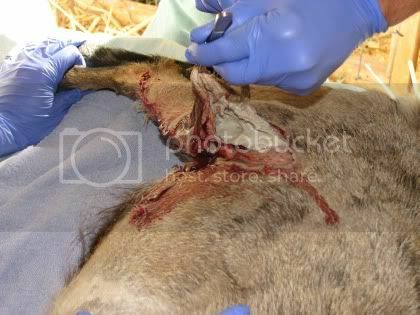 Just out of curiosity, do goats respond well to abx and pain meds? They’re know to be such tough creatures, you know, they can eat tin cans and such… hope his prognosis is good. yes they do respond well to injectible meds but not oral medications…because they are rumininates, the oral meds get broken down too far in their stomaches to be absorbed very well. chewie felt much better after his metacam injection this afternoon. Chewbacca (Chewie) is named for a very noble figure from our long forgotten past … second in command of the Millenium Falcon, a notable vessel in the intergalactic revolutionary wars. I have a fine photo, if I can attach it. It’s a fine name for a brave young goat! 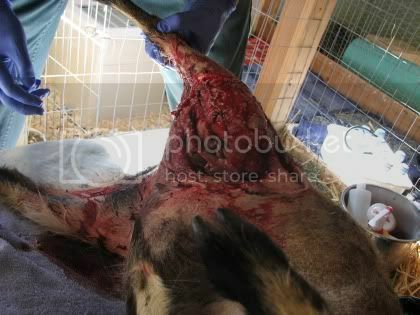 And for those who EAT goat…this is a good picture of what they look like getting all cut up!! Hopefully, it will turn some of you off meat forever!